To avoid the contractual circumvention of California’s unwaivable statutes, California courts are making it increasingly more difficult for parties to enforce forum selection clauses. This is evident in the California Appellate Court’s recent decision in the employment law case Verdugo v. Alliantgroup, L.P., 2015 Cal. App. LEXIS 466 (May 28, 2015). In Verdugo, as discussed below, the California Appellate Court refused to enforce a Texas forum selection clause in an employment agreement because the employer would not guarantee – by stipulation – that the Texas court would apply unwaivable California wage and hour laws to the dispute. Defendant Alliantgroup, L.P. (“Alliantgroup”) is a Texas company that provides specialty tax consulting services to businesses throughout the United States. From 2007 to 2013, plaintiff Rachel Verdugo (“Verdugo”) worked as the Associate Director at Alliantgroup’s Irvine, California office. As a condition of employment, Verdugo entered into an employment agreement that contained a Texas choice-of-law provision and a forum selection clause that designated Harris County, Texas as the exclusive forum for any dispute arising out of her employment with Alliantgroup. In April 2013, Verdugo brought a class action lawsuit in California Superior Court asserting numerous claims for wage and hour violations under California’s Labor Code. Alliantgroup immediately moved to dismiss or stay the action in reliance upon the Texas forum selection clause in the employment agreement. The trial court granted the motion and stayed the action finding that the forum selection clause was valid and enforceable. Verdugo timely appealed, arguing that the trial court erred because enforcing the Texas forum selection clause (and related choice-of-law clause) violated California’s unwaivable law on employee compensation. The California Appellate court in the franchise case of Wimsatt v. Beverly Hills Weight etc., 32 Cal.App.4th 1511 (1995), is credited with being the first to address which party bears the burden of proof on a motion to enforce a forum selection clause when confronted with unwaivable statutory rights. In Wimsatt, the franchisee plaintiff sued the franchisor defendant for violation of California’s Franchise Investment Law (“CFIL”). The franchisor moved to dismiss the action pursuant to the out-of-state forum selection clause in the franchise agreement. The trial court granted the motion and the franchisee appealed. The Appellate Court reversed, holding that the party attempting to enforce a forum selection clause bears the burden to show enforcement of the clause is not unreasonable or unjust “when unwaivable statutory rights are involved because a forum selection clause otherwise could be used to circumvent those unwaivable rights.”5 In reaching this conclusion, the Appellate Court explained that a forum selection clause carries the potential to contravene unwaivable franchisee protections in the CFIL by placing litigation in a forum in which there is no guaranty that California’s franchise laws will be applied. In the alternative, Alliantgroup argued that the trial court’s ruling should be affirmed because it had stayed rather than dismissed the action. By issuing a stay, Alliantgroup argued that the trial court had retained jurisdiction and could “lift the stay” and proceed with the action if the Texas court later refused to apply California law. Again, the Verdugo court rejected Alliantgroup’s argument. Ultimately, Alliantgroup’s failure to stipulate – coupled with its continued downplay of the California labor laws – suggested that Alliantgroup was intending to seek to enforce the Texas choice-of-law provision once the case was moved to Texas. Because of this, the Verdugo court reversed the trial court’s decision and allowed Verdugo’s claims to go forward in California. 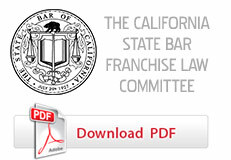 Although Verdugo is an employment law matter, the same rationale and analysis should apply to any dispute involving a non-waivable California statute – including those confronting franchise counsel and arising out of the CFIL and California Franchise Relations Act. This case report was prepared by Kevin A. Adams (kadams@mulcahyllp.com), of the Irvine law firm of Mulcahy LLP. Mulcahy LLP is a boutique litigation firm that provides legal services to franchisors, manufacturers and other companies in the areas of antitrust, trademark, copyright, trade secret, unfair competition, franchise, and distribution laws. Disclaimer: While every effort has been made to ensure the accuracy of this article, it is not intended to provide legal advice as individual situations will differ and should be discussed with an experienced franchise lawyer. For specific technical or legal advice on the information provided and related topics, please contact the author. Smith, Valentino & Smith, Inc. v. Superior Court of Los Angeles County, 17 Cal. 3d 491, 495-96 (Cal. 1976); America Online, Inc. v. Superior Court, 90 Cal. App. 4th 1, 11 (Cal. App. 1st Dist. 2001); Verdugo v. Alliantgroup, L.P., 2015 Cal. App. LEXIS 466, *5-6 (Cal. App. 4th Dist. May 28, 2015)(To be reasonable, the clause must simply have “a logical connection with at least one of the parties or their transaction.”). Corp. Code § 31512 (“Any condition, stipulation or provision purporting to bind any person acquiring any franchise to waive compliance with any provision of this law or any rule or order hereunder is void.”); Bus. & Prof. Code § 20010 (“Any condition, stipulation or provision purporting to bind any person to waive compliance with any provision of this law is contrary to public policy and void.”). Verdugo v. Alliantgroup, L.P., 2015 Cal. App. LEXIS 466 at *24 (citing America Online, Inc., supra, 90 Cal. App. 4th at 14). Verdugo v. Alliantgroup, L.P., 2015 Cal. App. LEXIS 466 at *2. See, e.g., America Online, Inc. v. Superior Court, 90 Cal.App.4th at 14 (reversing burden of proof to claims under the California Consumer Legal Remedies Act). Verdugo v. Alliantgroup, L.P., 2015 Cal. App. LEXIS 466 at *13. Id. (emphasis added); see also, id. at *30 (Noting that, although Alliantgroup “postulate[d]” about what a Texas court was “likely” to do, Alliantgroup carefully avoided making any specific and definitive argument that Texas courts either have applied or will apply California wage and hour laws despite a choice-of-law clause designating Texas law.). Copyright ©2012 Mulcahy LLP. All rights reserved. The transmission of information to and from the site, in part or in whole, does not create, and receipt does not constitute, an attorney-client relationship between senders and/or recipients and Mulcahy LLP.